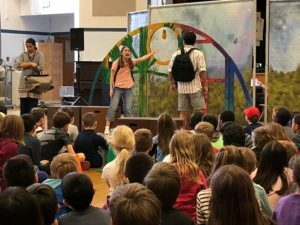 The 3rd, 4th, & 5th grade students and teachers would like to send a huge thank you to our PTA for bringing Book-It Repertory Theatre’s production of Inside Out and Back Again to View Ridge on Tuesday, March 20th. Watching one of this year’s most beloved Global Reading Challenge books come alive on stage has sparked amazing conversation with the students about what was included, what was excluded, and reasons for the change. Students were enthralled with Ha’s story about escaping Vietnam and her struggles to create a new life for herself in Alabama. There is currently a wait list on all library copies of the book. Thank you for your funding and support PTA.